EMDR has been around for a long time now, and although initially it had its critics, ("what works is not new, and what is new doesn't work"), it nevertheless has acquired an evidence base and hence credibility as a first-line treatment for PTSD and other conditions. Somatic therapy has been around in various guises for some time and involves bringing the body into an otherwise talking-cure dominated field. Given Damasio's and others work around somatic markers, and the understanding, over time, that emotions are physiological entities, as opposed to feelings, which are more mentation-experiences, this would make sense. Ideas about 'blockages' and other concepts have been around since Freud's time, if not earlier. The authors cover their history and what they have come to draw on in terms of theory and practice, and both are qualified and run training in both forms of therapy, and the integrated version of which they write. These include concepts such as embodiment, somatic intelligence, and the neurobiology of stress and trauma. In this latter case, you will be correct in assuming that much attention will be focused on regulating the function of these areas, in particular, the amygdala-thalamus-prefrontal bilateral circuits as the regulation of emotion and physical states related to systemic homeostasis is relevant to trauma processing specifically. Of specific interest is Porges' polyvagal theory in respect of the parasympathetic regulation of the ANS, namely immobilization and dissociation, which are most troubling from a somatic point of view. The role of various aspects of the tenth cranial nerve, the Vagus, is of paramount importance here as it regulates ANS function via its connections to wide areas of body and brain, hence the name, which means 'wandering'. The whole concept of Heart Rate Variability with the attendant phenomenon of Respiratory Sinus Arrhythmia, secondary to R1-R1 cardiac timing is relevant here as well. Problems with what Porges named neuroception can lead to hypervigilance and other trauma-related adaptations of this system. Most laypersons will know of Flight, Freeze and Fight, but here we include Fright, Flag and Faint, the more extreme responses when the more commonly known responses fail to elicit the desired outcome. Dissociation, a troubling phenomenon, often seen in Borderline Personality Disorder, with attendant non-suicidal self-harm, is part of the Flag phenomenon, and can lead further to fainting, a vasovagal phenomenon known as syncope in medical terms. Interestingly, this last may be linked to the emotion of disgust, a more insula-mediated emotion. Critical, from a developmental perspective, is the risk of future PTSD as a vulnerability conferred on children by tenuous parenting, resulting in attachment issues and certainly documented in children whose parents were traumatised before the birth: holocaust survivors in particular have demonstrated this in studies of their second and third generations, or after 9/11 for instance. Central to this book is the idea that the concept of embodiment also has implications for interpersonal neurobiology; one will recall that bonding in the attachment sense is a bidirectional process, not linear, between carer and child, and dependent on the intersensitivity of the dyad in being aware of self and other in terms of emotions experienced and expressed, namely, bilateral empathy. Parent and infant must learn to deal with misattunement in the relational interaction, and learning to constantly reset and reboot/repair is essential to normal development as no perfectly attuned interaction is likely or reasonable to assume as a given. Dysregulated carers are less likely to be available for repair interactions, hence difficult challenges emerge for the infant to negotiate. Thinking of the differentiation between implicit and declarative memory, and the sometime inability of Broca's area to allow verbalizations about these, as well as the preverbal expression of memory/trauma, the author's reinforce Janov's ideas about the need to concentrate on what the client cannot declaratively experience, namely the memories that are not readily available in a clear sense. This would not refer to recalling forgotten or not- processed memory, but to that which cannot be articulated, and hence exists only as a form of somatic memory. Caution is necessary, as implicit memory is unlikely to be that formed and accurate, and hence subject to distortion, confabulation or inflation, including gist memory elements for instance. Tolerating, both on behalf of the client and therapist, this lack of narrative in the recall is a challenge for both present. This is where staying in the present and not adding a verbalization to the feeling becomes a more mindful experience, vs. attempting to impose more meaning on a visceral experience. Neural networks thus become essentially a component part of any therapy. Traumatic memory can thus be thought of as consisting of impaired networks, a failure of integration with the more positive aspects of life, and hence remaining disconnected from them. Given that learning is stifled here, psychological flexibility in the face of such poor encoding is made difficult. New learning, namely resolving this poor encoding under similarly arousing circumstances becomes a target of therapy, allowing for more substantial integration of the memory into the overall experience of the mind. This is termed adaptive information processing, where the integration of external experience with internal, emotive contexts is facilitated, and necessary. The Dual Theory of mental processing applies here, with both laterality of processing as well as more top down processing of the 'two brains' as higher function and laterality of emotive vs verbal processing, including negative vs positive valence processing neurological networks apply. This is discussed several times in the book. Those who practice EMDR do know this as positive cognitions and VoC's are part of the preparation phase of the therapy, so we can have a safe, positive set of inputs to integrate with the negative associations of the initial trauma now focussed on in the later phases of the 8 stage EMDR practice. This positive toolkit of resources allows for continued sense of embodiment to be maintained during exposure to the traumatic memory, keeping the client grounded as an example of the need for a positive approach to the vagaries of life ("RDI"). In terms of Dual Theory, bottom-up attempts at regulation, or left-right rebalancing if you like, or stimulating thalamic or brainstem pathways, or engaging with and thus distracting working memory, increasing vagal tone and inhibiting sympathetic systems while boosting parasympathetic tone, inhibiting limbic overstimulation during the recall of traumatic memories, all are postulated as reasons why the dual stimulation of the EMDR movements, or tapping, or whatever is done, works. These movements can also be used as part of the positive resource building (RDI) phase, but this might be controversial. Perhaps, after all, the bilateral stimulation effect might re-orientate the patient to the safer, here-and-now environs in the presence of their fears, but this is only one of the theories as to how this works, and perhaps they all are correct. Integrating somatic therapy is designed to focus on increasing interoceptive awareness and developing a capacity to stay with painful emotions and sensations, avoiding flooding by careful pacing. Somatic awareness, mindfulness (top down processing) and the capacity for dual attention are all part of these authors' approach. 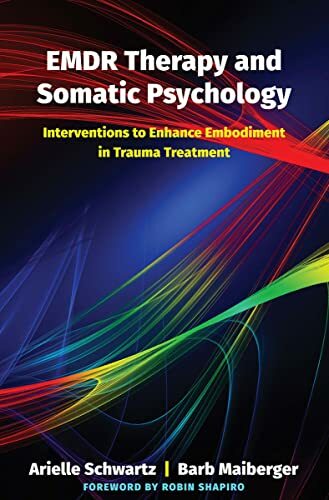 As I noted before, the therapist is not excluded from this process, and an increased awareness of embodiment is promoted in the therapist, so that there can be mutual regulation of verbal and non-verbal interaction, the 'social' nervous system described elsewhere in the book. Chapter 3 covers the seven principles of EMDR, namely phase orientation, mindfulness, non-interpretation, experience, relatedness, regulative, and resilience-informed, for those arriving at EMDR for the first time. The regulation focussing is an interesting one, working on Siegel's idea of a window of tolerance, an optimal zone of tolerance for the emotional experience of that moment. Outside of these zones, there is intemperance. Working through those emotions within the window, not below or above, allows the patient to avoid the pitfalls of hypo- or hyper-arousal and heal within the window. The last principle, that of a reliance on human capacity for resilience, namely healing/thriving from and because of trauma, but in this case, somatic interventions are added to the mix on the basis of evidence, and delivered with compassion. Having set the stage for interventions, part two of the book embarks on just these. The stated target are interventions to enhance embodiment in trauma treatment. As is common in today's evidence based psychology, scripted approaches are offered which integrate somatic therapy into EMDR. Certainly Bessel van der Kolk has played a role for years in this practice. The principles above are regarded as deepening the process of embodiment, via the mindful, experiential and relational interventions within all 8 phases. A greater awareness of the somatic elements might lead for instance to preverbal experiences coming to the fore, and being accounted for, or those that generate physical pain. However, in this introduction, the author's note the need for flexibility, including modifying the rigidity of the process to suit individual needs and levels of comfort, as well as in order to not disturb the therapeutic alliance by being slavish in application. Curiosity about these somatic experiences is key to the mindful approach, and the development of a somatic vocabulary, a descriptive rather than judgemental use of language, to circumvent avoidance for instance in voicing distress. This is often a new way of approaching issues in trauma, as opposed to the judgement imposed on such things as we grew up and matured, a new skill to be developed in therapy. Being more descriptive of uncomfortable sensations allows for a greater and more open experience, rather than focussing on what each sensation might, or might not mean. I mentioned a form of empathy before, so therapist self-observation is a useful addition to the mix of therapy, describing in passing Deikman's observing self, a kind of Go Narrow- Go Wide mindful exercise, where we, or the patient, alternate focus between internal and external stimuli: in effect, this is focusing attention between mesial and lateral areas of the temporal lobes, and hence alters perceptions. Such focus, outward and inward, can in turn be global or focused, and helps develop skills in awareness, and avoid pitfalls in preferences for any of these foci. There follows an exercise in therapist observational skills, and interventions to increase body awareness and awareness of the effects of proximity, containment of somatic distress, grounding (sensory toolkit), sensory awareness, grounding (legs and feet), grounding (into gravity), calming breath, energizing breath, and so on. Boundaries and the body get more specific attention, a boundary exercise here utilizes string for instance. Building affect and sensation tolerance, so key in borderline personality presentation, prompted by trigger words such as guilt, shame and so on, adding bilateral stimulation if warranted. Pendulation requires the oscillation between negative and positive states in those clients who may be so damaged by experience that tolerating both states, distress and resource, is difficult. The intervention here involves identifying both states, and the cue words that represent them. Bilateral stimulation is ONLY added to the resource-positive experience, until tolerance for the distress state is noted. The fourteenth intervention here is to introduce the more somatic approach with postural awareness, and then a sensation-based inquiry about the body leading to body mapping intervention (15). Story-telling without words seems silly, but is the next intervention, and one can imagine how this would work well with clients whose experience is alexithymic. The habitual stress response can then be focused on (17), and then a useful target development bridge. Use of the SUDS scale, namely their subjective, digitized view of the somatic distress evoked by recall during the desensitization phase, follows, and then intervention 18, the sequencing and somatic repatterning during that phase, for stuck processing, and pendulation between internal and external awareness (20). Intervention 21 covers the embodied integration during the installation phase, and as suggested earlier, 22 will cover the concept of positivity, in this case referencing the future. Chapter Five will cover complex PTSD and attachment trauma. This would refer to adults who suffered early childhood stresses, stored as motor patterns, sensations, affective states, and psychophysiological arousal, namely somatic states associated with the arousal that emerges in interpersonal interactions when young that are to say the least, traumatic. Schore's attachment states are enumerated, namely Insecure-Ambivalent, Insecure-Avoidant, Disorganised (Type D). The therapist caveat here is a repeated one: the therapist has to be aware of their own issues to guard against these interfering with the therapy, as perhaps up to 50% of us have some form of attachment issue below the surface. Shame and unworthiness are the salient signs of the interface between C-PTSD and attachment trauma. History taking begins the approach here, then working with shame and building safety in the body, namely interventions 12 and 13 before, and now 23, relational attunement for shame, and intervention 24, Building Safety in the Body. Work then follows on Ego States (part states), drawing on Ego State Therapy, Internal Family Systems Therapy, Structural Dissociation of the Personality from van der Hart, mentioned before. Cues sheets follow for identifying somatic, affect, cognitive and behavioral cues. Intervention 25 covers relational resourcing. 26 includes resourcing a part of self with a team of allies, and target development scripts, and later further interventions such as psychobiological regulation, attachment repair, safe place for a 'part', a golden nugget check in to see what positive has dominated the dark. A young 'part' may thus grow to adult. Chronic pain and illness have become part of the EMDR focus, and of course somatic therapy is a useful add on, being biopsychosocial in focus. History taking is again the primary focus, followed by several interventions, including self-care mental movie, restful sleep mental movie, and a place for Yoga (again van der Kolk and Emerson). Some elements that one finds in personal training incorporating Yoga include the use of a Seated Cat-Cow and Mountain Pose, Balancing, Child's Pose, and interventions around self-compassion and some target development scripts to finish off with elements of gratitude too. Self-care is noted throughout the book, which finishes off there, after touching extensively on cultural contexts, something few books do. This is a long and complex book, crammed with how-to elements, so that the end result is a manualized form of therapy addressing somatic elements with some reflection in EMDR, but not entirely centered on the practice, or at least the bilateral stimulation elements. It is much more than an EMDR book in its focus on Somatic Therapy, which of course is the point of the book. The around 30 interventions will take up a lot of therapy time, and for many around the world this would far exceed most client's capacity, so judicial use of the interventions and checking in procedures is required: training in other words. To use the book effectively, which does not replace training, one should seek training and refresher training in both skills, namely EMDR and ST. Incorporating all the other elements of therapies to make it more comprehensive certainly works, eg movement, mindfulness, Ego work, and of course self-care really works well, and draws on the other things we as therapists have to learn. For everyone working with traumatized patients with issues ranging from frank PTSD to attachment disorders in personality presentations, anxiety, relational issues, body-related conditions, this is a valuable manual, more than just a book. Roy Sugarman PhD, Director: Applied Neuroscience, Performance Innovation Team, EXOS USA.